1. Hi Tara! First things first where are you originally from? How did your home shape who you are now? I was born and raised in the Reno/Tahoe area. Now, when I look back at it, I was always so eager to get out of Reno and travel, but it was not until I left and then returned for a while that I really began to cherish the beauty of Lake Tahoe. I believe living there really allowed me to appreciate nature and the everyday beauty that surrounds us. Also, the water has always been my healing and safe place. 2. It's Breast Cancer Awareness Month. Tell us what that pink ribbon represents to you. So, first of all, I’d like to share with you the true history of the pink ribbon. A woman named Charlotte Haley originally handmade peach-colored ribbons in her dining room with cards that said "The national cancer institute annual budget is 1.8 billion, only 5% goes for cancer prevention. Help us wake up our legislators and America by wearing this ribbon." Then, in 1992 Self magazine contacted Charlotte and asked if they could use her ribbon to put onto their magazine and cosmetic products. She refused as they were using it to gain more readers and sell products. So, they took her ribbon idea and changed the color to pink. Thus, the pink ribbon was born. So, I prefer the peach ribbon. To me it represents strength, resilience, and transformation. 3. At what age were you diagnosed with breast cancer? 26 years old. Yep, you read that right. 4. I imagine you were shocked, how did it feel to get this news at such a young age? It was devastating. I had actually found the lump in the shower in March of 2015, right after a SUP yoga class at the Yoga Journal Live in San Diego. I went to my primary care doctor who felt it and said it was nothing. She said she would do another exam once I came back for my annual OBGYN appointment. So, for 6 months I went on with my busy San Diego life, juggling yoga and my crazy schedule. Deep down, I knew something wasn’t right. September rolled around and I had my annual exam. She ordered an ultrasound “just to put my mind at ease.” Then, on 09/25/2015 I heard the words no one ever wants to hear, “I’m 95% sure it’s cancer.” This came from the radiologist after my quick ultrasound appointment became a 2-hour mammogram appointment. The old me died that day. I will never be the same and yet, I am so grateful for it. I was diagnosed with stage 2a triple positive (er+/pr+/HER2+) breast cancer on 09/30/2015. 5. How did yoga play a part in your recovery? Just like yoga can do, cancer stripped me down to my most raw and vulnerable form. I gave up my looks and had to turn within. I came face to face with my soul, devoid of all outer masks and appearancesI had always hid behind. I really was forced to face myself and my deepest fears. I will never forget, I went to a cacao ceremony with sound healing right after being diagnosed with my mom. We went around the circle, sharing why we were there. As it became my turn, my eyes swelled up my body got hot, and tensed up. And in that moment, I had to make a decision. Would I put up that front, and hide my emotions, or would I break down and be vulnerable? I decided to share and be seen and it was the most beautiful and uplifting moment. I knew I would get through my struggle and beat this disease, with yoga helping me heal emotionally along the way. Yoga allowed me to deeper my connection to my true self. I got extremely sick from the chemo, so most of the time I was on my mat by my bed practicing restorative poses. One day, when I felt ok to leave the house, I just went to the ocean and stood in Tadasana, feeling the wind and sea on my face. It was so healing. Yoga doesn’t have to be fast-paced vinyasa flows. Sometimes you just need to stand in Tadasana. I’m actually just finishing up my yoga teacher training in Ocean Beach. It’s something I’ve been wanting to do for years and now that I am healthy, I’m so grateful to see how resilient my body is. I’ve been practicing yoga on and off since seventh grade, but it wasn’t until I moved to San Diego three years ago that my practice really began to develop. 7. How has being a cancer survivor shaped who you are today? Breast cancer was a miracle in disguise for me. I didn’t know it then, but I sure do now. This disease transformed me into the most beautiful warrior goddess I never imagined I could become. Transformation is not easy. It is uncomfortable and very painful at times, but after going through this experience, I am very proud and comfortable with who I’ve become. I’m not the old Tara I once was. 8. Tell us about your goals for the future. 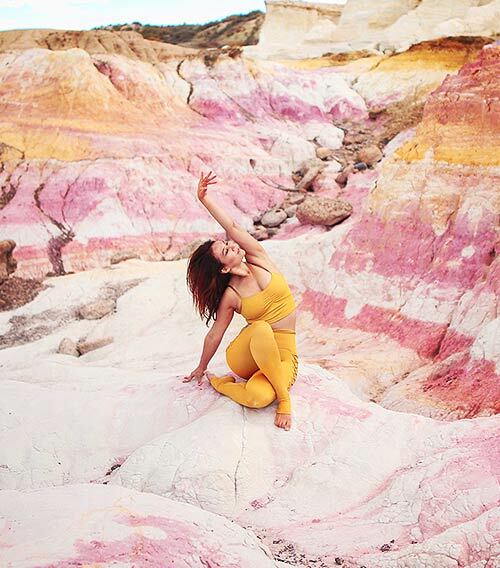 I am going to be opening up a yoga/wellness business in San Diego where I will do pop up yoga events and workshops throughout Southern California. During my cancer journey, Iturned to Reiki and Shamanic healing. I will have completed my Reiki Master training by December and will be offering healing to others as an integrative wellness modality. I want to be a source of light for women who are battling this disease, and show them that people do get through it and life can actually be better on the other side. I also plan on hosting yoga retreats for cancer survivors. My short-term goal is to now get certified in yoga for cancer recovery. 10. What/Who keeps you inspired? My family keeps me inspired. I didn’t know my family could get any closer until I was diagnosed with cancer. I called my mom in Nevada on a Friday night with the news, and she was literally on my couch Saturday morning. She rented a house two blocks away from my boyfriend and I and stayed the entire year and a half helping us through my treatment. Also, the amazing yoga community around me inspires me daily. I love hearing how people are changing their lives and focusing on healing. This is what the world so desperately needs right now, more healers, especially female healers. We are the ones that will change the world. 11. You can live anywhere in the world - where would you go? Barcelona. That city has a special place in my heart. I used to live there with my best friend and I miss it terribly. Does my fur baby, Zeus count? I can’t live without my dog. What else…my altar where all my favorite crystals reside. My comfy bolster my dad gifted me from Nevada City. 14. What's your favorite way to de-stress? Going to the ocean. Anytime I am having a really difficult time, I drop everything and go straight to the water. I also love weekend camping trips. 15. I see that you've been Burning Man. Many people say there is no other festival like it!! What draws you to Burning Man? Ohhh Burning Man. I started going in 2012 because I heard it was life-changing and growing up in Nevada, that was the thing to do. I finally made it out there and realized it was the one place where you could totally be your authentic self without any judgement what so ever. It is a great model for how we need to live our lives. I couldn’t go last year since I had just had a double mastectomy and was undergoing reconstruction, so I made a promise to myself that my boyfriend and I would make it back to the playa in 2017. What a year it was! I was able to go out there with a new set of eyes. Life just seemed more beautiful. I didn’t take anything for granted. One of my favorite mornings was on a Wednesday, when my boyfriend and I woke up around 5am and walked to the temple with my dear cancer letter I had engraved on a piece of wood along with a chest of all my old bras to burn. We placed everything in the temple, cried together, and then popped a bottle of champagne while watching the sunrise. Then out of nowhere, a Shaman appeared and I joined in with blessing the four directions. It was pure magic and so perfect. That is what Burning Man is all about. Those life-altering moments of true introspective healing. 16. What songs are you loving at the moment? 17. I love your Instagram name, @healed_healthy_whole. How do you practice a wholesome lifestyle? Thank you, I practice daily gratitude. I am so thankful to be here. 19. Chasing your dreams and believing that you can do anything...What does it take? Courage and self-love. It all comes down to becoming comfortable with who you are and not listening to what anyone else says. You have to follow your heart. 20. One thing you wish every woman would take home as far as body image goes. You are beautiful. We are all these perfect souls living in these temporary bodies. There are so many societal pressures women face today regarding body image. We must stop comparing ourselves to one another, and instead lift each other up. However, I do feel that something is shifting, that we have entered this phase of life where women are really starting to take a stand for themselves and their bodies. We are perfect in our imperfections. Thank you so much Tara for sharing your empowering story! You are a warrior goddess & we are completely inspired by your words, encourgement & rawness.